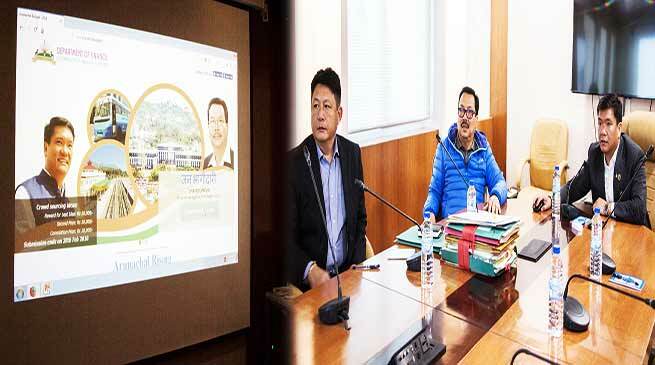 Pema Khandu Govt in Arunachal Pradesh is going to make one more record in the history of Arunachal Pradesh by providing an opportunity to a common citizen to shape and write the annual budget for the state and thus for this purpose, Chief Minister Pema Khandu launched an interactive website www.arunachalbudget.in asking suggestions from the common people. It must be mentioned here that, on 23rd Jaunary of this year, Pema Khandu govt made another record in the history of Arunachal Pradesh when all the ministers including chief minister presented their report cards of respective departments before the public at a function held in Namsai. The main objective for launching this website is to facilitate participation of the common citizen in preparation of a wholesome budget for the next financial year, wrote the chief minister in his timeline. In order to encourage people’s participation, the state government has also kept cash prizes for the best three suggestions or inputs. While the best suggestion will get a cash prize of Rs 50000, the second best suggestion will be awarded Rs 30000 and the third best suggestion will bag Rs 20000. The chief minister has mentioned in his time line “We are committed to take Arunachal forward with the Team Arunachal mantra and each and every citizen of the state is a member of Team Arunachal, who has the right to shape the future of Arunachal Pradesh,”. Meanwhile , this is a good step of the govt which may help in building a people friendly government.